I’d made chickpea cutlets from Veganomicon before, and although I enjoyed them I didn’t think they were quite as fantastic as the rest of the vegan world seems sure they are. But I always planned to try them again, so when Friday dawned cold, dark and damp, and my husband declared a longing for mashed potatoes, I decided to go for it. One of the problems I had last time was that I couldn’t seem to get the cutlets flat but I had no problems with that this time. I think that wheat gluten has a bit of a mind of its own and I’m certainly more used to it now than I was last time, so maybe that was one of the improvements. I also decided to bake 2 and fry 2 so that we could do a direct comparison – the internet world seems to be split down the middle. I marginally preferred the baked and my husband marginally preferred the fried but both versions were infinitely better than my first attempt and I am beginning now to see what all the fuss is about. They’re such an easy centrepiece to knock up, and from reading various blog posts and forum discussions people are varying the spices, throwing them in sandwiches, serving with salsa, BBQ sauce, and almost anything else you can imagine! I served them with mashed potatoes, spinach and a slightly tweaked version of the mustard sauce I used from Veganomicon last time. I used less mustard and less wine, and generally messed about with the flavourings until I got a taste I liked, and it was really tasty. Sometimes I make a recipe and think it is fantastic then am disappointed the second time I make it. Fortunately this time it was the other way round and it just proves that you should never give up on a recipe after just one attempt! And even the photo is better! 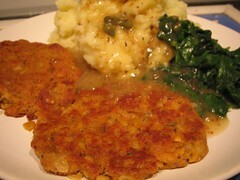 This entry was posted in Veganomicon and tagged Veganomicon by efcliz. Bookmark the permalink. I love the vcon chickpea cutlet. I like the results better with Panko bread crumbs. Better yet with whole wheat panko bread crumbs. Glad you gave them a second chance. I also did not have a good first attempt at these cutlets. I still haven’t tried to make them again, though. I’m sure I’ll get around to them again! I am so glad you posted about this. I bought some premade seitan and have STILL not made it. I am looking for a good recipe. But I DID go get some vital wheat gluten and also some nooch yeast for good measure (hadnt tried it before).. Your great review, advice, and experience about this recipe makes it seem exciting and something I would like to try. I hope to have great results too.. and know that its okay to work with the ingredients! I am such a “by the book” recipe girl.. thanks for the great tips! I wasn’t struck at first either, until I tried baking them. Now I LOVE them. The leftovers are awesome on a sammie too with lots of spicy vegan mayo! good to know that they can be better… last time i made them…ick! i’ll probably try again now that i know it can be better. i have been dying to try these – just haven’t gotten around to it. but i will definitely try the half-baked, half-fried approach for my own comparison. I really need to make like a triple batch and stow them away in my freezer. They’re so versatile! I’ve done chickpea cutlet parmesan, and cut them up and dipped in ketchup like chickpea fingers. But they’re great on their own too. I still haven’t tried these, but I want to. I just tagged you for a 7 random things about yourself meme. I made these last night and discovered that I didn’t have all the ingrediants I needed, so I improvised and they turned out great! I only had 1/4 cup of wheat gluten left so I mixed that with 1/2 cup of flour and they stuck together quite nicely. Then, instead of bread crumbs, I used oatmeal. I also added some garlic salt and oregano in them as well. Definitely a cheap, quick and yummy meal. I live with 2 omni’s and they absolutely loved them.